Research. What's An Idea Worth? Okay, this is the SECOND e*Knowledge step... skilling-up on your RESEARCH techniques and strategies. This thinking is akin to being in the desert, recognizing that there's a need for water and then setting up a water shop. YES... There is a need for water in the desert. And... THERE'S also another need for a successful water shop in the desert. CUSTOMERS who have the MONEY and are WILLING TO PAY for the water. So, how does this line of thinking translate to the web? If you're skilled at researching on the web then, "go play among yourselves for awhile".... while those who aren't so skilled bring their skills up to speed. The web is a democratic system. This has some good points and some bad points. The GOOD points? Well, it's democratic. The BAD points? Well, it's democratic. UNDERSTAND these differences and you'll understand how to search for information much more effectively... Web Search Strategies is a series of tutorials on Web Search Strategies and Techniques. It's highly recommended reading for both the novice and the expert. Once you have an understanding of the difference search criteria used by different Search Engines, then you have to decide what it is that you wish to research... in relation to setting up your web business. What you're looking for is HIGH DEMAND... LOW SUPPLY. On the net there is bound to be an ample supply of virtually anything you can dream up. HOWEVER... there is no need to be alarmed at this, because here - more than anywhere else - the Marketing principal *Sell the difference* (meaning... find out how your product is different from your competitors and sell that "difference") applies. Fortunately, if you *do yourself* then *that* is the "difference." Step One: Identify what it is that you wish to sell on the net. This MUST be something you know a lot about, or are passionate about. Step Three: Focus on YOUR difference. It's called micro-niche marketing. You'll need COPERNIC - Click here to download Copernic 2001 Basic Now - to completely refine your search process, and get fast results. AND, you'll need an understanding of this Micro-Niche Marketing approach. ALTERNATIVELY... if you're specifically interested in creating information or software products, then Jim Edwards in his ebook eBook Secrets EXPOSED goes into great detail about the ingenious methods he uses to choose products to develop before he develops them... thus ensuring their financial success. RESEARCH First... before you set up a web site. MASTER the necessary web search skills. RESEARCH your idea to see what the competition is doing, and then *Sell The Difference* by doing YOURSELF. Do NOT copy. For FAST research results use COPERNIC. Understand the essential principals of Micro-Niche marketing on the web. These above are some of the critical techniques to use for research on the web. It is just not possible to analyse and list every possible technique here, as every day more techniques are being developed. 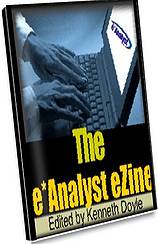 All new techniques will be discussed in-depth in The e*Analyst ezine. -------->> T E S T I M O N I A L <<-------- "Ken, your ezine is one of the few I take time to read. It's filled with real, practical advice on web marketing - from a guy who knows what he's talking about!"